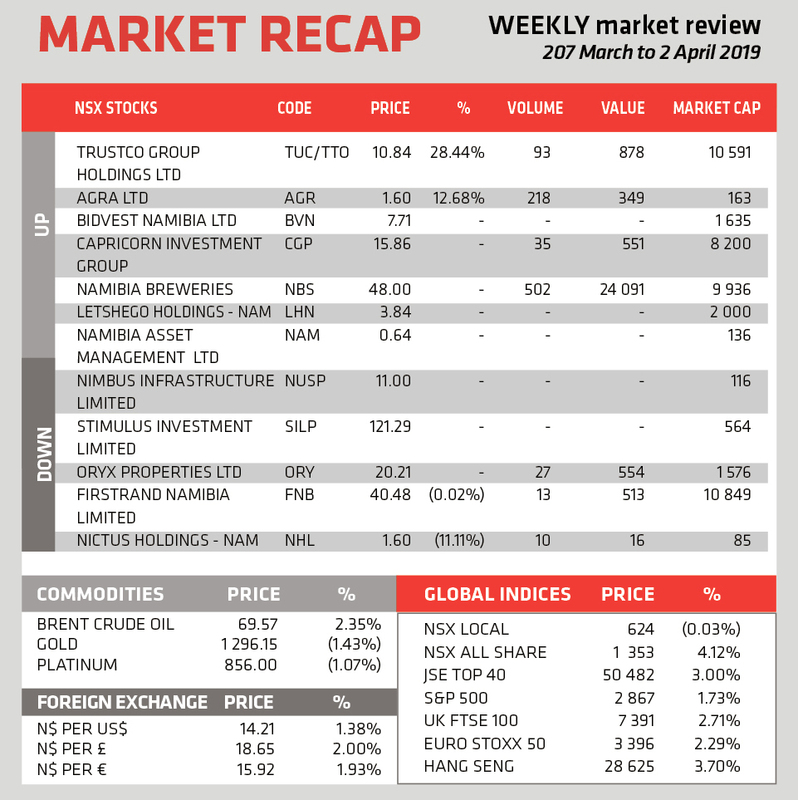 The local market was active this week, with the NSX Local index down 0.03% at 624, and the NSX Overall Index up 4.12% at 1353. As at 2 April, FirstRand Namibia was the largest local company on the exchange, with market capitalization of N$ 10.8 billion, followed by Trustco Group with N$ 10.5 billion, Namibia Breweries with N$ 9.9 billion, and Capricorn Investment Group with N$ 8.2 billion. Trustco Group lead the market this week, with growth of 28.44% to close at N$ 10.84 per share, with Agra in second place, closing at N$ 1.60 per share after growth of 12.68%. In terms of volume Namibia Breweries lead the market with N$ 24 million worth of shares traded, with Trustco Group in second place with N$ 878 000 worth of shares traded. The local currency gained 1.38% against the US Dollar, to close at N$ 14.21 per USD, and gained 2% against the British Pound, to close at N$ 18.65 per GBP. It closed at N$ 15.92 against the Euro, a gain of 1.93%. 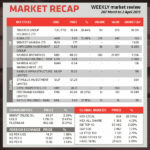 The rights issue of Oryx Properties closed last week, with 8 336 538 of the 15 789 275 linked units subscribed to. With the units on offer for N$19.59, Oryx has thus raised N$ 163 million of its proposed N$ 309 million available in the rights offer. With this rights offer, Oryx aims to reduce their current gearing level of 43% down to 33% by settling debt, as well as preparing their balance sheet for investment opportunities in the Namibian property market. The reduction in finance charges will be distributed to unitholders, while the remaining capital raised will be applied to projects such as the development of the first phase of the Elisenheim convenience centre, construction of an industrial warehouse on an existing property, solar power installations and acquiring residential developments.